A Thurber Prize Finalist of exuberance and ambition, spanning one thousand years of high-seas adventure, environmental and cultural catastrophe, and enduring love. Key West, 2016. Sea levels are rising, coral reefs are dying. In short, everything is going to hell. It’s here that two young filmmakers find something to believe in: an old sailor who calls himself Daniel Defoe and claims to be five hundred and sixty years old. In fact, old Dan is in the prime of his life--an incredible, perhaps eternal American life. The story unfolds over the course of a millennium, picking up in the sixteenth century in the Viceroyalty of New Granada and continuing into the twenty-sixth, where, in the future Democratic Federation of Mississippi States, Dan serves as an advisor to the King of St. Louis. Some things remain constant throughout the centuries, and being on the edge of ruin may be one. In 1560, the Spaniards have destroyed the Aztec and Inca civilizations. In 2500, we’ve destroyed our own: the cities of the Atlantic coast are underwater, the union has fallen apart, and cars, plastics, and air conditioning are relegated to history. But there are other constants too: love, humor, and old Dan himself, always adapting and inspiring others with dreams of a better life. 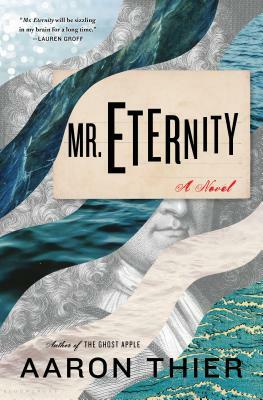 Aaron Thier is the author of the novels Mr. Eternity, a finalist for the 2017 Thurber Prize for American Humor, and The Ghost Apple, a semifinalist for the 2015 Thurber Prize. A regular contributor to The Nation and a graduate of Yale University and the MFA program at The University of Florida, Thier received a 2016 NEA Fellowship in Creative Writing. He lives in Great Barrington, MA.